There are 3 posts tagged Paul Scally (this is page 1 of 1). Rainham North’s Conservative councillors appear to have begun their fight against a new football stadium being built in their ward. Gillingham Football Club Chairman Paul Scally called on fans to write in support of the Mill Hill site being pencilled in as the location of a future 25,000-seat stadium during Medway Council’s Local Plan consultation. Following Mr Scally’s decision to ask fans to write in support of the club, two local councillors, whose ward includes the Mill Hill site and surrounding area, have written to local residents, on Council-headed paper, urging them to make their own representations to the Council before the 18 April deadline. Vaughan Hewett, then a UKIP councillor for the area, presented a 400-strong petition of local residents against a stadium in 2015 and promised to continue to oppose any such plans in that year’s local elections, which he lost. Now it appears Councillors David Carr and Martin Potter, whilst striking a conciliatory tone in their letter, are ready to take up the mantle of a fight against both the ground and its enabling development. The councillors’ letter comes as Mr Scally has written to selected households in Gillingham with free tickets for the Gillingham v Fleetwood match on 22 April, in what appears to be the start of a PR campaign in support of his future plans for the club, their new ground and the site of Priestfield Stadium, the club’s home since it’s formation in 1893. Anyone who wishes to respond to the Local Plan consultation, whether on the stadium or any other matter, can do so either by email to futuremedway@medway.gov.uk or by post to Planning Policy team, the Planning Service, Medway Council, Gun Wharf, Dock Road, Chatham, Kent, ME4 4TR. The consultation closes at 5pm on Tuesday, 18 April. As birthday presents go, it was perhaps one of the most bittersweet, but when I woke up to the news this morning that Justin Endinburgh had been relieved of his duties at Gillingham, I couldn’t help but raise a smile. When Justin was appointed Gills manager in February 2015, the style and approach he brought to the team provided entertainment and promise. Becoming one of the dominant forces at the top of the league by the end of that year gave us fans hope that we could find ourselves back in the Championship, for only the second time in our history. Then, when I returned from Barcelona that Christmas, everything started going downhill. It’s impossible to say with certainty what triggered our collapse from top to an ultimate ninth-placed finish, but an injury to our star-player Bradley Dack, a confidence-collapsing loss at Wigan Athletic and a seeming inability for Edinburgh to change his tactics after teams had worked out how to beat us all played a part. Nobody with a heart would act with malicious glee at somebody losing their job, but when this season started in the same way as the last had ended, it was clear Edinburgh was on borrowed time. I became a convert to the “JED out” cause in October, but was less vocal than others, believing the most important thing is always to support my team. I don’t believe that the players weren’t trying, I just don’t think they felt comfortable with the way we were trying to play, or how we were trying to play. I am not sure they even understood exactly how we were supposed to be trying to play. Yesterday, I was sat in the block next to the Directors and immediately glanced at Mr Scally at full time. I had a hunch, just by the expression on his face, that Edinburgh had managed his last game, something I mentioned on one of the Gills forums on Facebook. 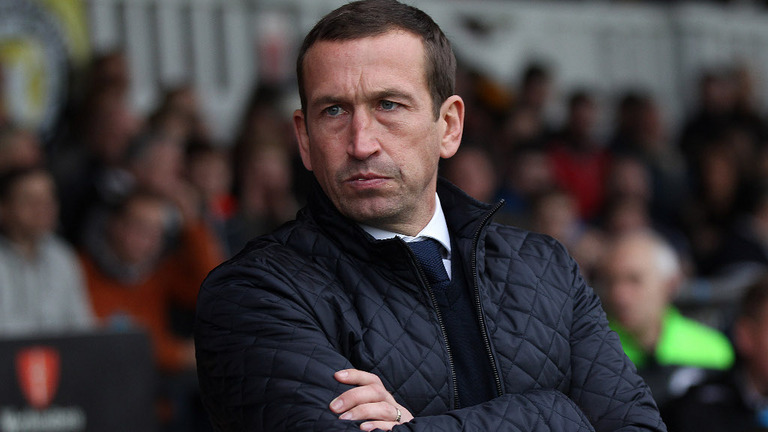 Now that Edinburgh has gone, I would like to thank him for his hard work at Gillingham, and for some special memories, but hope that a new manager can turn our form around permanently and help us start pushing towards the top of the table again. Mr Scally has said that he started working on the new management team last night, and does not want to have a drawn-out interview process (like the five weeks it took to appoint Edinburgh). With no game this weekend, he has some time to find the right man before the next match at Oldham. The fairy tale of Gillingham ended, like all good fairy tales, in dramatic fashion. 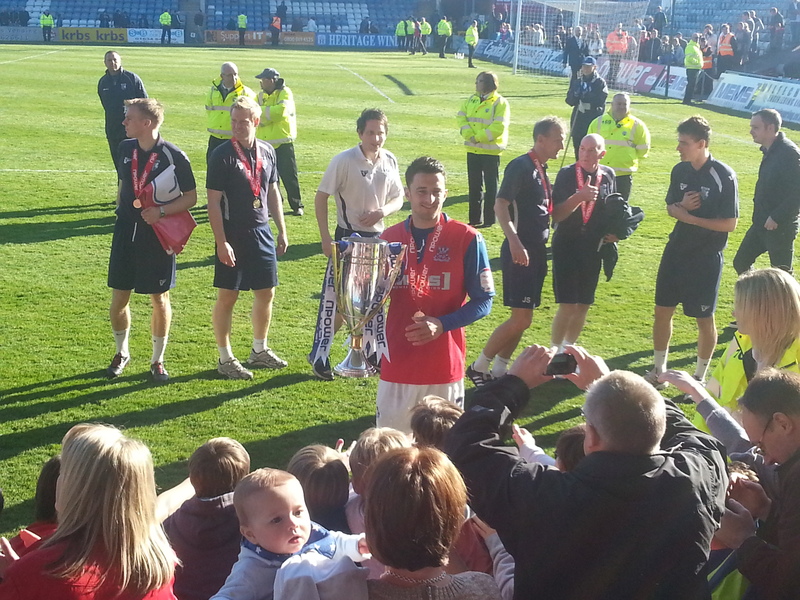 The blue boys, playing in red as they have done throughout their centenary season, only needed one point to secure the nPower League Two trophy but, after less than 23 minutes the thought of a draw was far from the minds of players and fans alike. Veteran striker Deon Burton opened the scoring for the Gills early on with a strike that seemingly came from nowhere before former Don Danny Kedwell doubled the Gills’ lead heading in Chris Whelpdale’s cross. The Gills kept pushing until the second half, when they returned from the dressing room playing like they’d OD’d on valium. AFC Wimbledon, fighting for Football League survival for the first time in their short history, saw their chance, with Jack Midson bringing them back into the game after the hour and Jon Meades levelling the scoring with less than ten minutes to play. Every Gills fan knows that supporting the club is not easy, and were nervously watching the clock as referee Andy D’Urso seemed to drag out stoppage time. In the end, it need not have concerned Gillingham whether they won, lost or drew, as Port Vale dropped points at home to Northampton, securing the Gills’ League Two title as the sun shone on the MEMS Priestfield Stadium. In times of success, it is fashionable to congratulate those who made it happen – and it went without saying that on Saturday the Chairman, Paul Scally, the Manager, Martin Allen, the Assistant Manager, John Schofield, all the backroom staff, Captain Adam Barrett, the whole playing squad and, of course, the loyal fans, were all mentioned in dispatches. Also worth giving thanks to, though, are the sponsors – those who, along with paying fans, fund the football club and have allowed such a successful squad to be built. To Medway Mowers, sponsors of the 37 goals scored at the MEMS Priestfield Stadium. Ah yes, to MEMS, who sponsor the club and the stadium, and whose logo has been seen across the country side-by-side with that of the Football League sponsors nPower (the irony of which I will let you research yourself). And to all those whose advertising space can be seen in matchday programmes and advertising boards around the ground. There is now just one game of the season to go and Martin Allen may look to play those who have spent much of the season warming the bench. He is keeping his selection under wraps for now, but the Medway Messenger are reporting that Mad Dog is approaching the final game of the season differently.